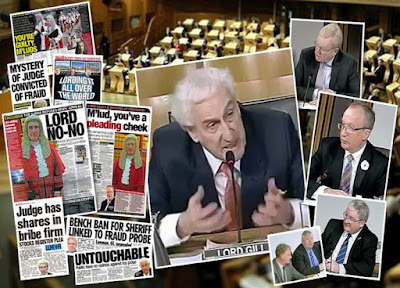 If I remember correctly Lord Gill told msps judges cannot be seen as a branch of Government and same transparency cannot apply yet here they are meeting up with ministers to coordinate policy against your petition. 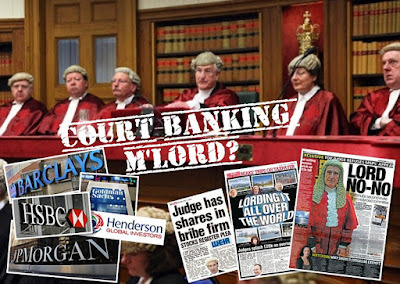 Very wrong all this messing about in back rooms trying to protect bent judges just because you rumbled their interests and we all know it don't we. 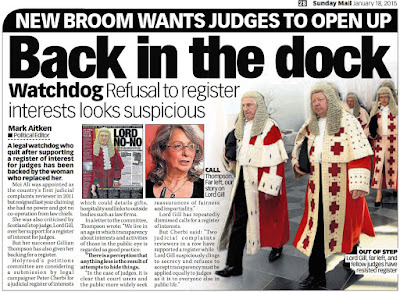 Come on MSPS put this register into law and stop the faffing about and while you are at it lets have a big investigation into judges and what they are really up to. 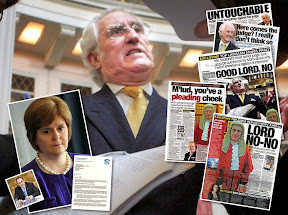 Release it Nicola and show you really are for a new Scotland not all these old ways of secret meetings in smoke filled rooms behind our backs! 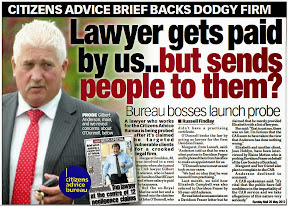 Oh yes, keep you advised m'lud on how we ditch transparency and arm twist to get our way on this. 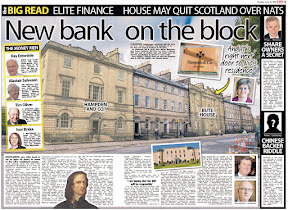 Will Kenny MacAskill be playing any role in this secret deal to block democracy? 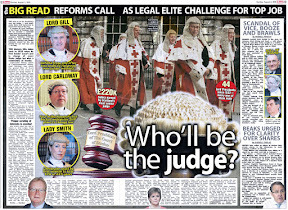 Oh yes jolly good old chap Roddy do your bit for Scotland and make sure no one gets to find out all the rotten secrets of corrupt judges on the take! 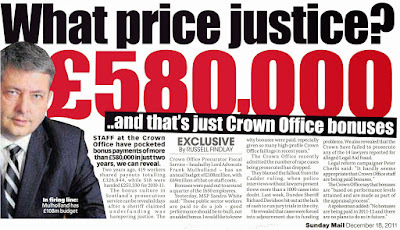 Is this the same Scottish Government who promise a different kind of Scotland from the unionist version? George Orwell's Animal Farm comes to mind! 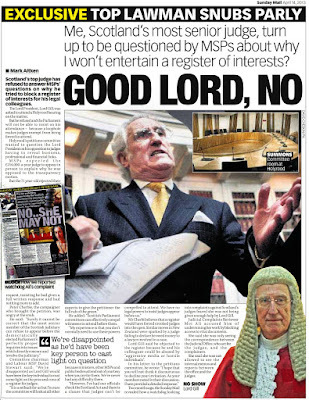 Can anyone explain why judges are allowed not to declare their interests and what idiot allowed them to get away with this? 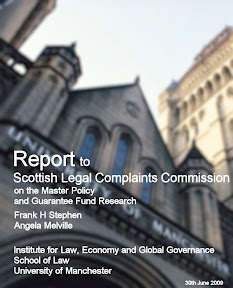 Good point.Yes, Lord Gill said something similar in his angry letters to msps ... available in previous reports on the blog and on the Scottish Parliament's own website. 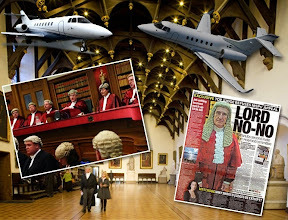 The UK judiciary (Scotland, England, Wales & Northern Ireland) gave themselves the power to refuse to declare their interests and no one in Government has opposed this to-date. 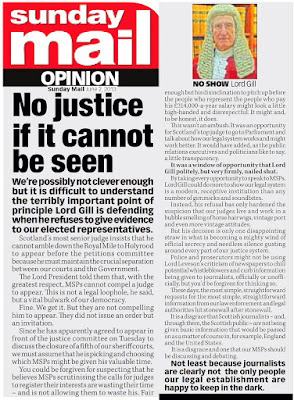 Gill and his mob must have a lot of heavy dirt on the SNP and Sturgeon for her to say what she did in the letter.Or is Nicola planning to make herself Lord President?! 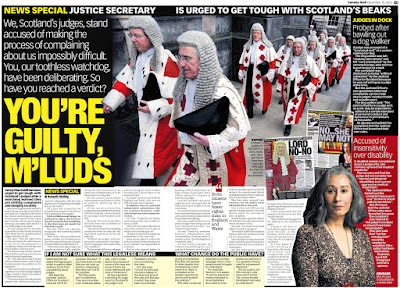 There must be a shortage of black ink in Scotland with all that censoring going on! 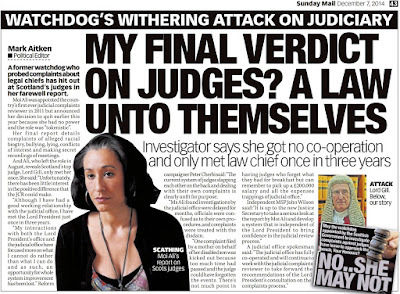 Completely aside from your register of interests (I fully support you on this) there has to be a full investigation into cases where judges have not declared their interests. 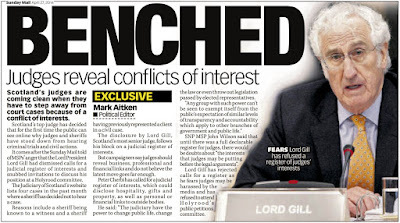 All the cosy relationships between civil servants politicians and their friends on the bench in the emails you obtained and now outed by you.Well done for having the guts to take on the judiciary. 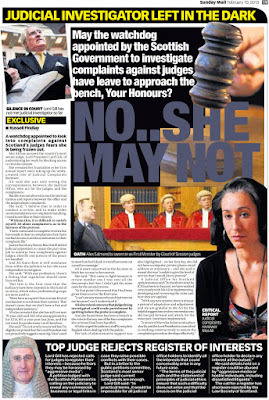 Rubbish.Already disproved.What are you hiding Nicola and what deal did you make with the judiciary? 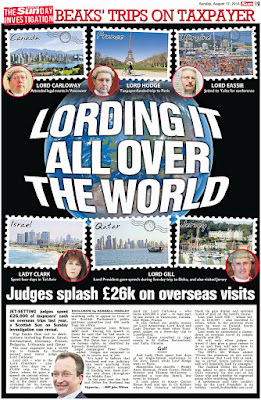 Politicians declare their interests so why not judges?Too much to hide me thinks! 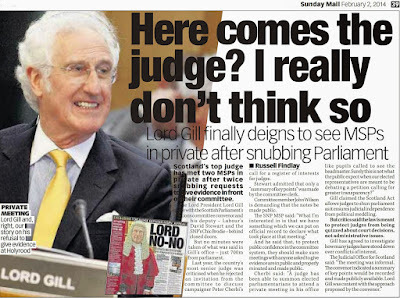 Complete Rubbish and you know it Nicola.Judges defend themselves all the time.Lord Gill has been doing a good job of defending himself and his colleagues from declaring their interests.He even roped you St Nic to defend his interests! Just to say you run a very hard hitting blog.Keep up the good work! 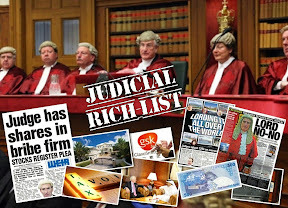 Reading through your postings on this register of interests just think of all the money that has been spent trying to defeat it - a mark of what is at risk here with the judges and their mega rich status and power as you say. 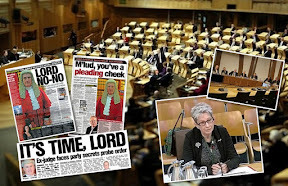 There is a real stench of corruption in how judges and politicians have come together to undermine you even though as you already pointed out there is cross party support in the Scottish parliament for your petition and why not - because it has to be judges declare their interests like everyone else. Thanks for a brill read! 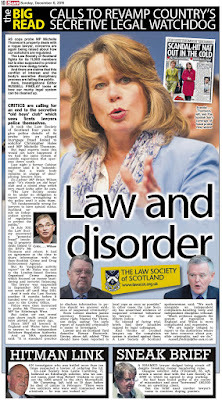 Jan with the brass neck.She was a regular at MacAskill's side and now I see she is pitching up with Wheelhouse to hold his hand. 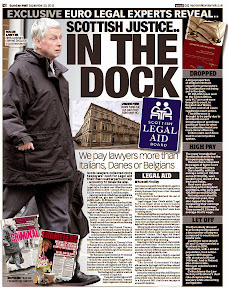 Hey Jan why not tell us about how all the justice dir. 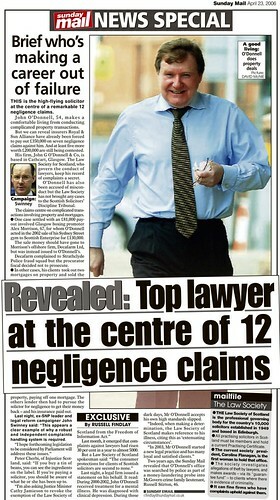 staff willingly covered for the boss when he was with Dr you know instead of "in a meeting". Brown envelopes favours and how to get rid of you were the topics I imagine. These people have respectable job titles but I can assure you they are a foul mouthed bunch just like any ned off a housing estate when they get together. This was a meeting directed against you and nothing would have been off the table. 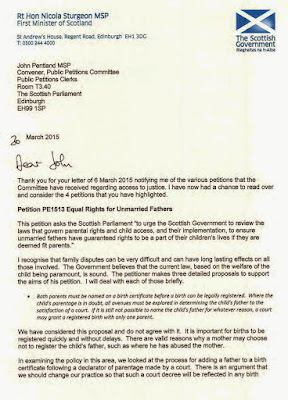 Is this what the Petitions Committee 'forgot' to ask for the last time around? Was it really 'forgot' or did Kenny do some arm twisting on behalf of Nic..
Makes you wonder what kind of people will fight against such a proposal. 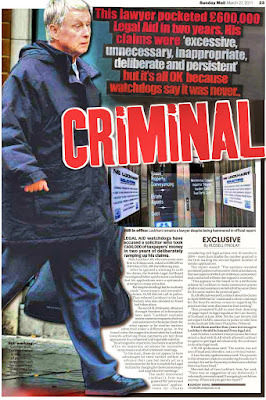 Crooks and those with something to hide. 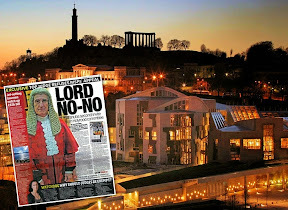 Everyone gets it.As was said earlier MSPs must legislate on this and make law.If the judges do not follow they must be led by our elected representatives instead of Scottish Parliament having to bow to unelected old men wearing fancy dress and wielding unchecked power. It makes one wonder exactly what they are hiding and why the SNP are allowing it to happen but not really surprised by SNP dictators. 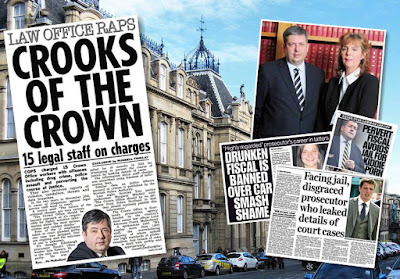 All that rubbish from Sturgeon about a different Scotland and here we are civil servants and politicos conspiring with judges to keep their ill gotten gains a secret.The dishonesty club ride again.Scottish Dishonest Government at it's worst. Saw a discussion about this somewhere else and everyone is saying a very bad call for Sturgeon.Good to see the mask slip and people realise what the nats are really up to and no different from any other political party when it comes down to it. 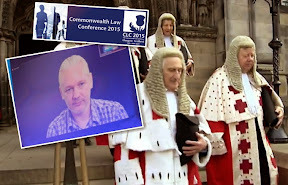 What kind of people fight against transparency?The real criminals who run the justice system for their own profit! 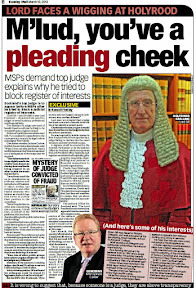 Not only on your petition Mr C .. these private off the record meetings are highly indicative of the way the SNP are carrying out law changes in Scotland for their own benefit with judges and lawyers brought onside to see whatever mad proposal they want is steamed through into legislation with a promise any subsequent court challenge will fail. 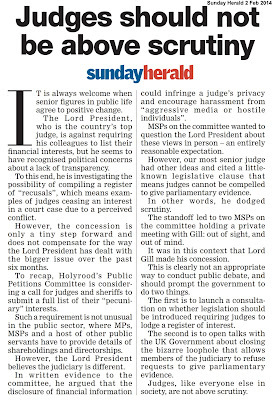 Clearly the very last thing Nicola Sturgeon, MacAskill & Co have on their minds is 'the Public Interest'. 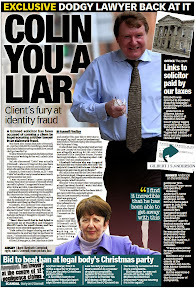 I certainly will not be voting SNP after these revelations and I will be encouraging other to do likewise. 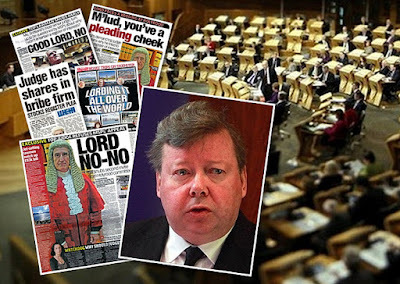 Let's just hope the Petition Committee members - McAskill, the new Chairman and Jackson Carlaw apart - have the backbone to fulfill their pledge to represent their constituents best interests and make the Register law........NOW! 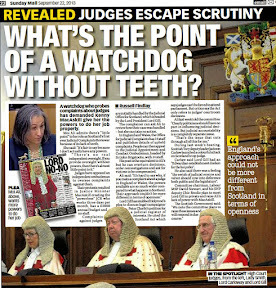 Both Sturgeon and McAskill are lawyers, and no doubt each have a few skeletons in their cupboards,so no surprise they should engage in 'behind the scenes' manoeuvering to scupper the petition. Let's hope the Sun and others start asking Sturgeon questions about this, even if this risks them being labelled 'aggressive'. 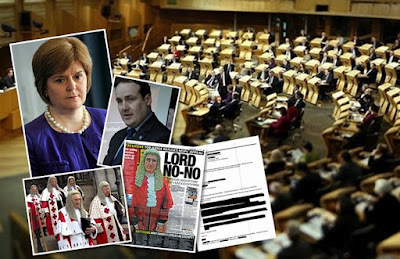 "The existence of the secret get together between Scottish Government Ministers and judges desperate to conceal their vast and varied interests from the public - only came to light in a letter of intervention from Scotland’s First Minister Nicola Sturgeon to the Scottish Parliament’s Public Petitions Committee at the end of March." 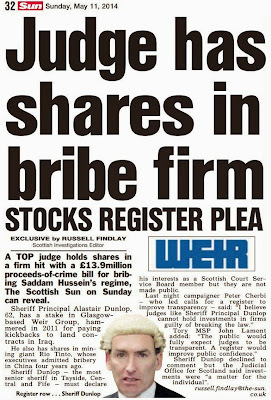 How interesting .. the SNP helping judges to conceal their tax dodging and business links. How does this fit into not being the same as other political parties?Haha! 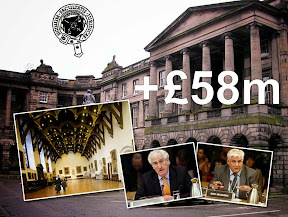 Contrary to what some of your readers may think, this meeting you have obtained the details of more than adequately illustrates the weakness of the SNP and Scottish Government, not it's strength. 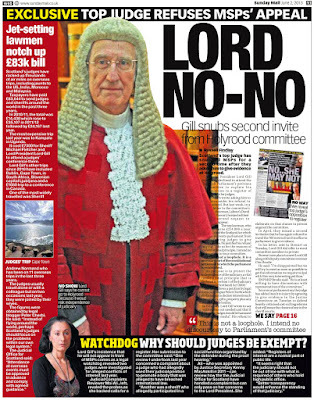 Paul Wheelhouse and his aides were forced into a meeting with Lord Gill and the judiciary, not the other way around. 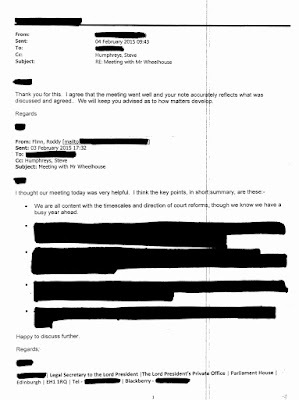 Any concessions made were clearly on the part of SG and not the judiciary.The unredacted part of the email is conclusive evidence of this. Who is to inform who? Correct. 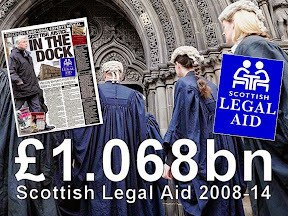 The fact is, the Scottish National Party and their pretendy Scottish Government and the wee pretendy parliament are unequal partners to the legal establishment and Scots Law.SG and SP can say what they like but without backing of legal circles, legislation does not fly and SG ministers are as impotent as an empty bottle of buckfast. 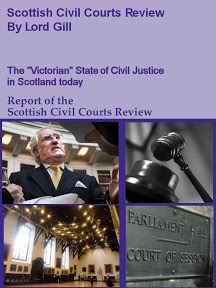 All the efforts of the SNP, manufactured news websites, torchlit rallies and rabid online postings of calls for opposition politicians to commit suicide or be shot at dawn can be swept away at the stroke of a pen by Gill, Carloway or anyone else on the bench.The six or so people who control the SNP understand this all too well. 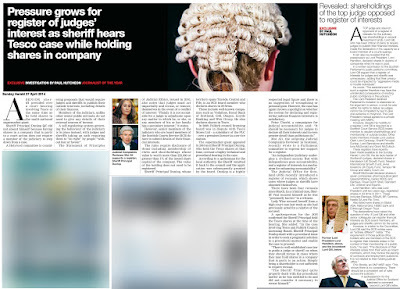 Weakness.This is what anyone with an informed inquiring mind will gather from your revelations of private meetings between SG ministerial teams and the judiciary. Even the security services are now more transparent than the judiciary .. this cannot be allowed to stand in a modern democracy. 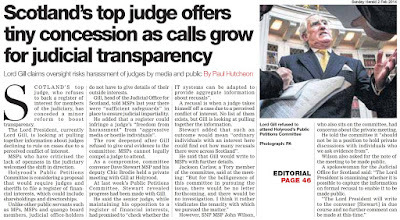 The Scottish Government have an interest in maintaining secrecy on judicial interests for the same reasons the judges do ... vested interests. 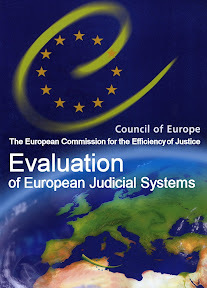 True.Without support from the legal establishment legislation does not work and in any case is usually and easily twisted to match vested interests ... everything done with the approval of the judiciary ... written into law after law, even the rules and oaths applying to the judiciary itself. Good observation on the Wheelhouse-Gill meeting ... your account sounds exactly how it turned out. 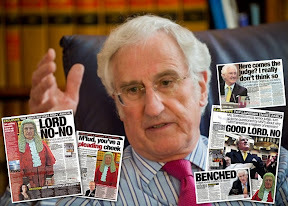 Cant think of anyone else who has such a good handle on judges and lawyers.You take the prize Peter and team! 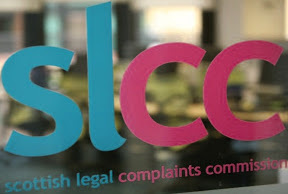 That comment on the weakness of the SNP compared to the legal mafia is spot on.For all their bluster they can do nothing about the lawyers or anyone related.and six people in charge of the party is also how it is. 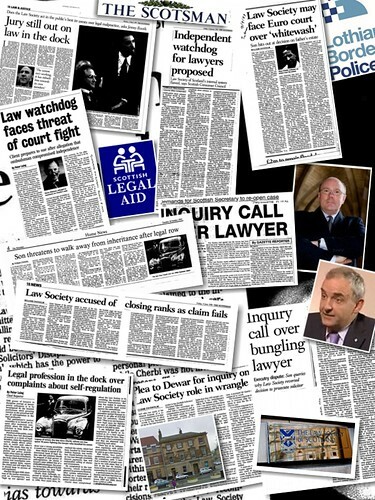 Very odd the entire Scottish Government is being mobilised against a petition calling for transparency. 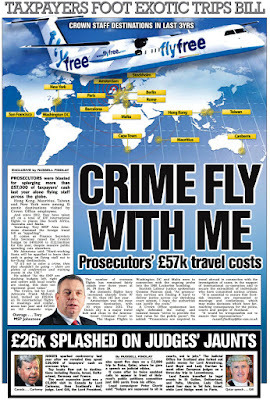 It is as if Scotland is being run by a criminal gang. 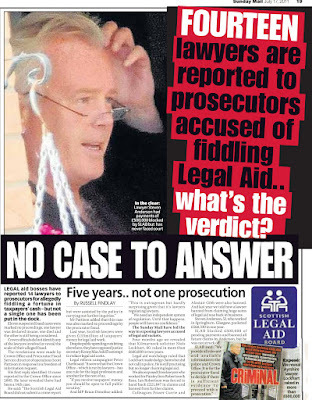 Well it is certainly the case legal vested interests are steering policy their way as is evident from tweaks to legislation and regulation. 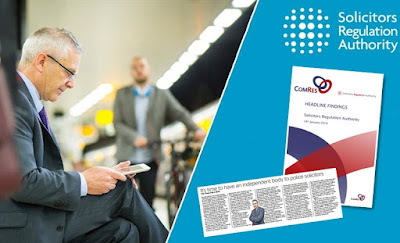 You don.t have to be a rocket scientist to figure out vested interests are throwing their weight around to increase their take and benefits to themselves, not the wider community at large. 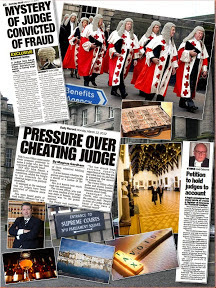 The judges must be so rotten they have demanded Sturgeon cover up all their dodges and fiddles!and what is this about civil servants and ministers having to report back to judges?Can't they do their own dirty work? interesting how you wrote this,not really having a go at anyone just putting the facts forward and publishing the material.Dare I say this is what journalism used to be about? 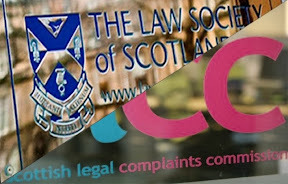 The power in Scotland is wielded by the Law Society of Scotland and they Instruct Judges and Scottish Politicians to carry out the Law Society of Scotland's unlawful agenda. 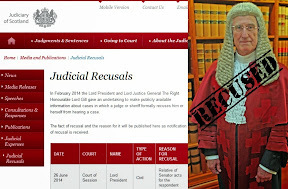 This blog has the makings of a good political drama!